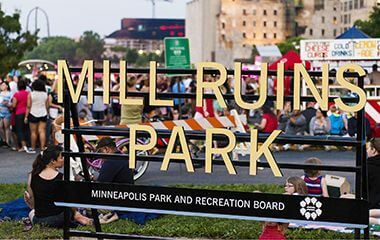 Mill Ruins Park	Mill Ruins Park combines an exploration of the history of Minneapolis with present day activities for all ages. Guided programs and tours are available. This industrial powerhouse was the catalyst for the development of Minneapolis and the birthplace of a number of companies which remain significant to this day, including General Mills, Pillsbury, Washburn Crosby (WCCO), and Xcel Energy. 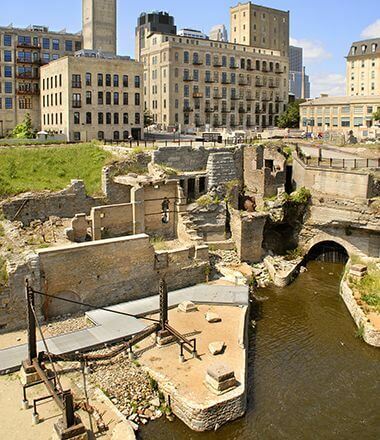 Mill Ruins Park lies within the St. Anthony Falls Historic District and is listed on the National Register of Historic Places. 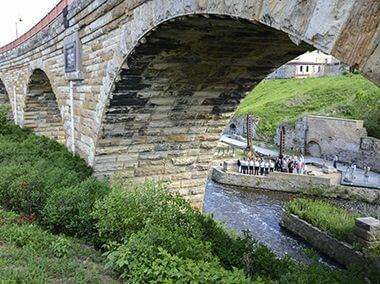 Mill Ruins Park is directly adjacent to the 1883 Stone Arch Bridge, a National Historic Engineering Landmark constructed to connect Midwestern farmers and their crops of wheat to the booming flour production mills. Name: The park was named for the ruins of the flour mills which occupy the site. The land for the park was acquired in 1985 as a part of the acquisition of the west river banks for West River Parkway. 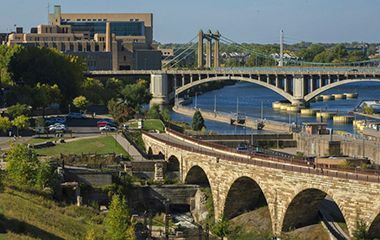 A company that manufactured concrete held a long-term lease on the land, which it acquired after the nearby lock was built in 1962 to lift boats to the upper harbor above St. Anthony Falls. After the U.S. Army Corps of Engineers filled the old tail races from the mills to construct the lock, it leased the land for 99 years to the company that used it as a storage site for sand and gravel. The park board purchased the lease and relocated the company’s storage facilities upriver at a cost of $8 million. 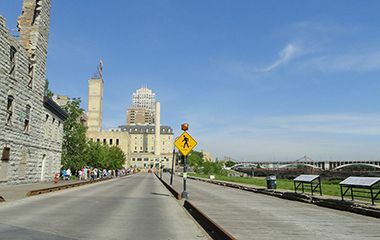 The funds were provided primarily by the state legislature though the Metropolitan Council as part of efforts begun in the 1970s to redevelop the riverfront and create a central riverfront park. From early on in the efforts to redevelop the area and extend West River Parkway into downtown, the historical significance of the site was an important consideration. 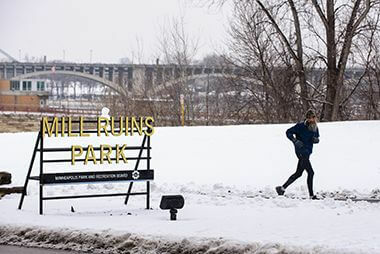 The site was excavated and its development planned under the direction of the St. Anthony Falls Heritage Board, created by the legislature in 1988, and the park board. 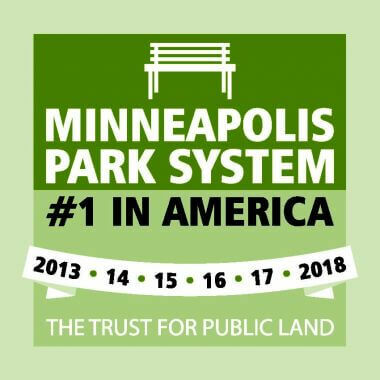 The National Park Service contributed to the development of the park as part of the Mississippi National River and Recreation Area, which had been established by the U. S. Congress in 1988. 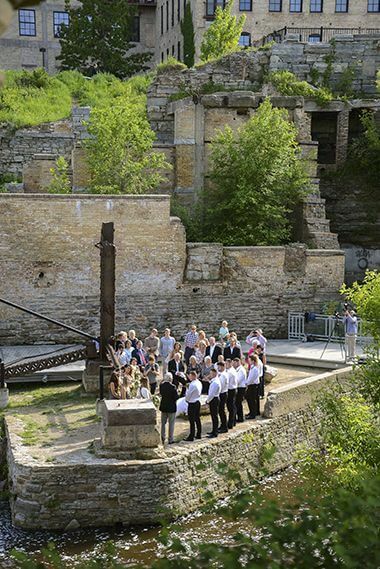 The goal of the development of Mill Ruins Park was to give park visitors a glimpse into the history of the mills in the area, which had been so important to the history of the city and the region. The park was opened to the public in 2001. In 2003 a 650-foot section of West River Parkway was converted to an oak plank road similar to the original plank road that spanned the canals which carried water back to the river after powering the mills. The park was completed in 2005. The planks in the parkway were replaced by concrete in 2010 due to deterioration of the planks and their noisy condition. In 2012, a Nice Ride bicycle rental kiosk was installed at the park. 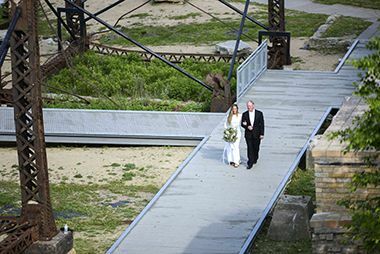 Minneapolis parks make picturesque backdrops for your cherished event. 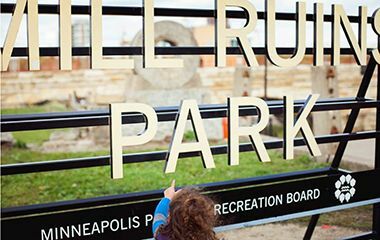 The park tells its story through the now exposed historic walls and waterpower features long buried beneath many feet of sand and gravel. If you're traveling on West River Parkway, Mill Ruins Park is a great place to take a break! 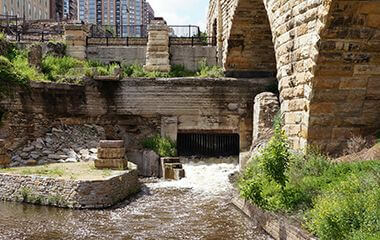 Mill Ruins Park is partly underneath the historic Stone Arch Bridge, just across the river from Water Power Park. 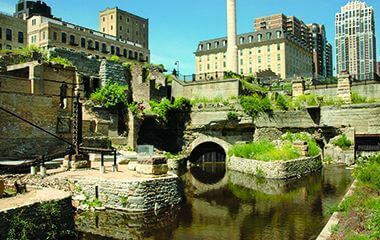 Mill Ruins Park lies within the St. Anthony Falls Historic District and is listed on the National Register of Historic Places. In the 19th century, this area of mills and canals was the leading international producer of flour, a commodity which was shipped both nationwide and worldwide. Snow and ice don't stop park goers from enjoying the outdoors! 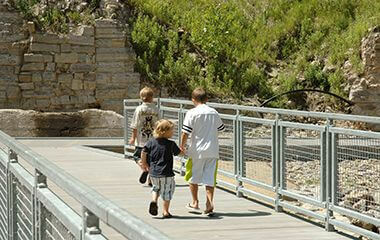 Enjoy a riverside walk through the mill ruins on raised walking paths and bridges. 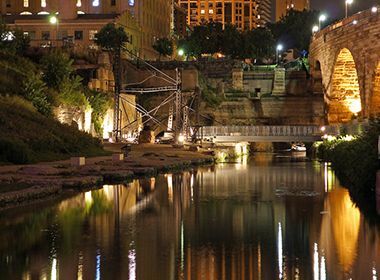 Just a block east of the park, the Mill City Museum has lots more information on the history of the city's mills! During the summer months, events are hosted around the park and throughout Central Mississippi Riverfront Park nearly every weekend.